Pimat will increase inflow of energy – Kirlian photography research. Every life organism emits light (radiates energy), which produces around the organism a specific, electromagnetic and biological field, called biofield. It is manifested by an aura which degree of completeness testifies to the state of the organism stamina and vitality. If your body is weakened, overtired, or ill, its surrounding aura is incomplete or weak (Fig. 1). If on the other hand, your body is strong and additionally energized, it is surrounded by a complete aura – full of vitality (Fig. 2). 1. Dr Tadeusz Wiecki on Pimat’s therapeutic effect on various conditions: “Depression and chorea severe insomnia, prickling sensation all over and problems with thinking and coordination. This 40-year-old woman patient slept normally the very first night after using Pimat. Her other symptoms disappeared in a few days. A woman aged 80 suffering from pains and unable to leave bed. Her daughter placed a Pimat in her bed without telling her. Next morning she got up unaided and was able to walk. 35-year-old woman with radiating pains. After one night with Pimat, the pains subsided, to disappear completely in a few days. Hyper excitability, sleep disorder, bedwetting. A 7-year old boy now calmer sleeps soundly, bedwetting infrequent, since using Pimat. Chest carcinoma with metastasis bone pains in entire leg. A male patient aged 50 found pains diminished and he felt better with Pimat. Addicted cigarette smoker with very poor circulation in legs; terrible pains made walking impossible. This male patient reported that after 12 days of using Pimat, the pains had subsided; he felt stronger and had regained the will to live. Menopausal problems – inflammation-related pains in ovaries, hot flushes, headaches, sleeping difficulties. This woman (aged 48) found her problems disappeared almost entirely after starting to use Pimat. This research was carried out by the Neurological Department of the St. Petersburg (Leningrad) Military Medical Academy. The aim of the research was to assess the effectiveness of Pimat in clinical practice for people suffering from pain and nervous complaints. After 7 days of using Pimat people reported “a feeling of warmth” and “a pleasant pressure” in the lower-back region. Those suffering from lower-back pain experienced a reduction in pain after 4-5 days. By then, the spasms of the back muscles were too slight to be measurable. The neurasthenic sufferers slept normally, their sleep was longer and deeper and they woke up re-energized, after only 2 or 3 days with Pimat. At the start of the research program, their self-assessment questionnaires showed that they felt low, with little activity or energy and quite a high level of anxiety. After using Pimat, the level of well-being and general energy was higher, their anxiety level was measurably lower. 17. Effect of PIMAT on mitotic activity of leucocytes in sus scrofa L.
PIMAT is a square cloth measuring 18 cm x 18 cm with dots printed at particular spots. The inventor of PIMAT, Ryszard Olszak, registered his product with the Patents Office of the Republic of Poland in February 1991 under the name ‘Generator of an Electro- magnetic Field’ (claim No 289128). According to the inventor of PIMAT, the action of this product is based on the energizing effect of its geometrical configuration (EEKG – a Polish abbreviation for this introduced by Professor J. Mazurski; or neoenergy – a term proposed by Dr S. V. King). EEKG, or neoenergy, means the action of a shape (geometrical configuration) on matter. It should be emphasised that in spite of a great deal of research, the nature of this phenomenon has not yet been elucidated in terms of physics. The energy emitted has not yet been measured by any conventional methods, that is, those that are scientifically accepted. In order to characterize and determine neoenergy, radiaesthetic colours are used. Radiaesthetic colour is a conventional notion meaning that a specific colour corresponds to a specific wavelength. PIMAT is described as a ‘regenerator of vital forces (or energy)’ because it generates an entire spectrum of radiaesthetic colours essential for the body to maintain a state of good health. Another feature of PIMAT is a wave that it emits which eliminates the effects of harmful radiation and neutralizes the effects of radiation associated with watercourses . From the point of view of radiaesthetic chromotherapy, fatigue or disease is indicative of a disturbance of the radiaesthetic colours in a given organism. • Mental – it regulates the nervous system. Depending on needs, PIMAT acts as either a stimulant or a sedative. Accordingly the most common sensations experienced by PIMAT users are an improved state of mind, an influx of energy and an increased enthusiasm for work and life in general. The effect that PIMAT has may be noticed as early as the first day of use. In particularly sensitive persons, a pronounced warming in the sacral region may be felt and a significantly reduced need for sleep experienced (this could explain why some of the subjects responded negatively to PIMAT). However, these reactions generally subside after two or three days, and a phase of self-regulation and self-healing of the body follows. In some cases – sinusitis for example – positive effects can be observed 10-14 days after starting to use PIMAT, or even later. It should be stressed that PIMAT is not harmful to the human body. This has been confirmed by scientific research and radiaesthetic reports – the respective descriptions and opinions are presented in the chapters that follow. PIMAT is very easy to use. The user should place it printed side up in the bed, under the sheet, underblanket or mattress (not thicker than 25cm), at the level of the sacrum. The user is subject to the therapeutic action of PIMAT regardless of the body position. PIMAT never loses its therapeutic potency unless it is physically damaged. Every living organism radiates energy, producing around itself a specific electromagnetic biological field called biofield. The biofield is manifested by an aura, whose degree of completeness indicates the level of the body’s energy. If the body is weakened, exhausted or ill, the surrounding aura is incomplete and irregular. If, on the other hand, the body is strong and fully energised, it is surrounded by an aura that is complete. On 17th June 1991, the Biotronics and Electrophotgraphy Laboratory in Kielce started an experiment with the purpose of confirming the effectiveness of PIMAT as a radíaesthetic screen and its impact on the formation of the human aura. This experiment made use of the so-called Kirlian effect. Of the Regenerator of Energy named ‘PIMAT’ (second cloth version) based on electrophotographic tests (Kirlian effect). Manufacturer: Ryszard Olszak. The object under investigation was PIMAT – Regenerator of Energy – produced by Ryszard Olszak. PIMAT is a rectangle of linen cloth, its edges turned in (hem width 7mm) measuring 18cm x 17.5cm. The name PIMAT is printed on the upper part of the cloth; the phrase ‘All rights reserved Ryszard Olszak’ is situated in the mid-bottom section. All these labels are in black ink. In addition, the cloth has red dots of 10 mm in diameter. There are 10 such dots in all, distributed close to the edges of the cloth. No print can be found on the reverse side of the cloth – only traces from the front show through. This is the side where the Laboratory’s expert placed his seal. The test was to determine whether or not the object described above is useful as a ‘regenerator of energy’, and/or as a possible radiaesthetic screen affecting the human aura. Field exposure times were 0.5sec and 1 sec. The filming parameters are shown in part II (photos). 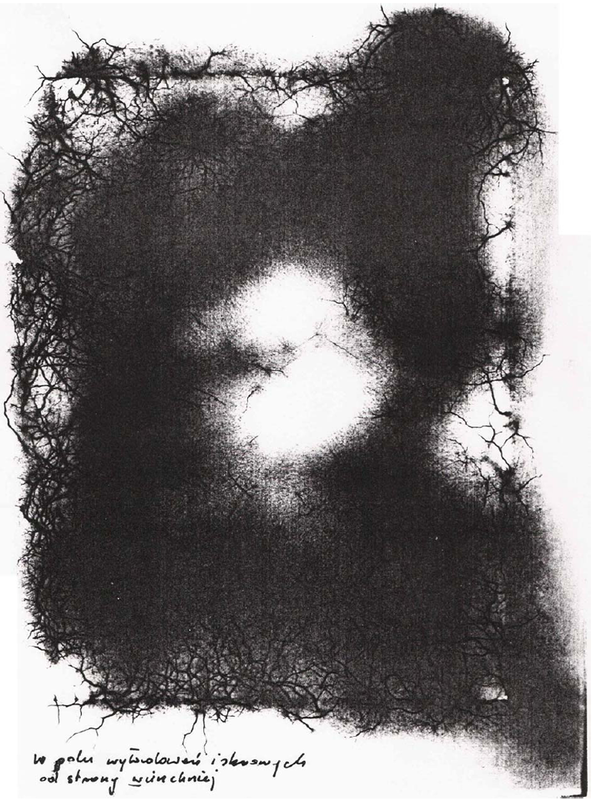 When incorporated into the Kirlian camera electrode system, PIMAT reveals features of a nonconductor without an aura of its own. It also has insulating characteristics for a high frequency field, which fact can be seen in photographs 1-3. One can easily distinguish that the PIMAT sample is made of cloth and the print and dots that form its other components. In photographs 4 and 5 one can again see that the cloth is an insulator, which creates a certain barrier to a high frequency field. Likewise, in a corona discharge flux field, PIMAT behaves like an insulating element, its top and reverse sides both acting as perfect insulators for the flux (photos 6-9). 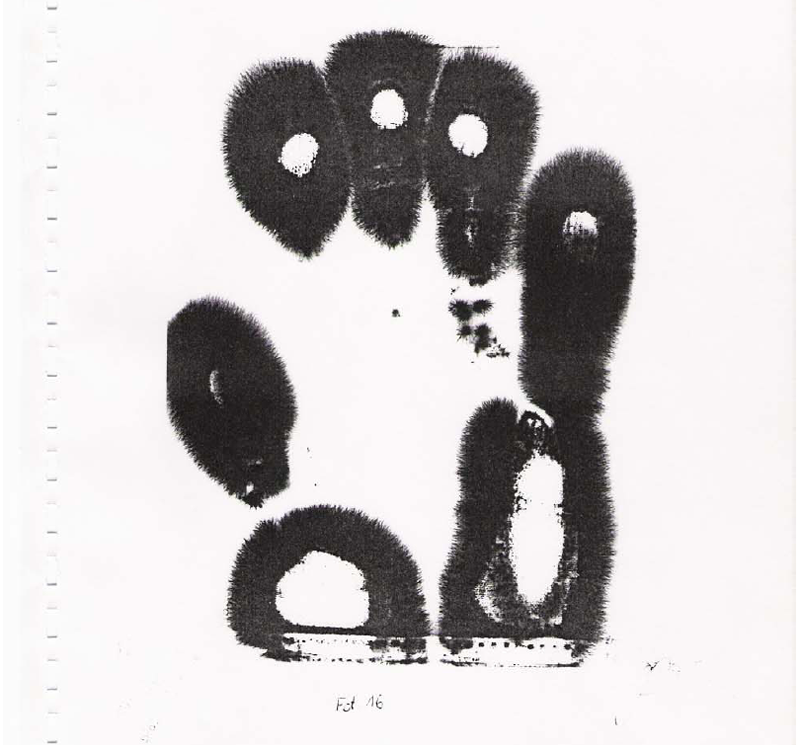 Photograph 10 shows an aura around the fingertips of the right hand taken directly on photosensitive material. Photographs 11-16 represent auras photographed through PIMAT. One can readily notice the texture of the PIMAT cloth. The aura, however, becomes less distinct but larger and more complete (see the encircled auras). It thus follows that when used directly for a photograph of the aura around the fingertips, PIMAT enlarges and completes the aura. 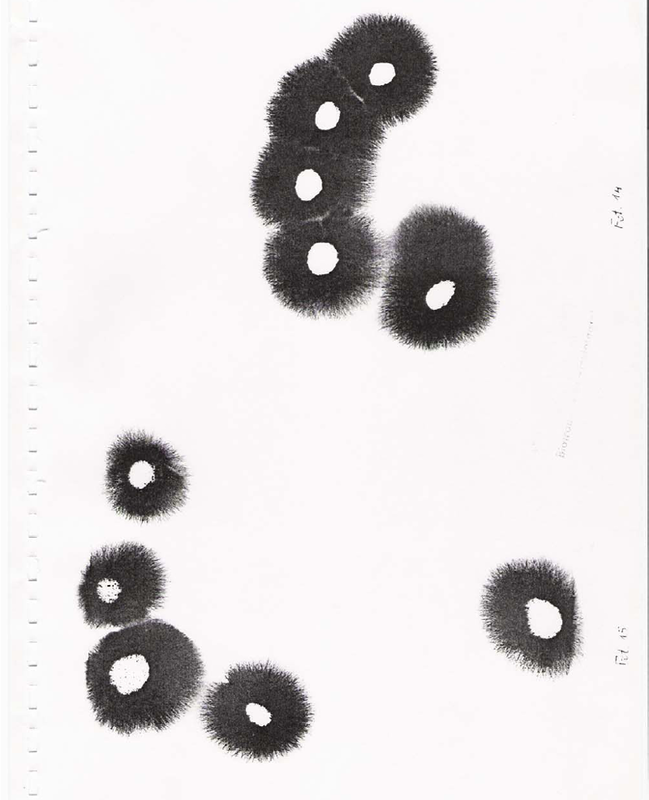 Photographs 1-7, part II of the visual material, display the formation of an aura around the fingertips under the influence of PIMAT after application to the sacral region (the experiment lasted 42 hours). After the application of PIMAT to a human sacrum at 16.00 hours on 17th April 1991, photographs were taken every 1.5 hours. After 6 hours a favourable effect was recorded – a considerable aura enlargement showed that PIMAT had a favourable effect on the human system. This favourable condition lasted for another 6 hours, after which time the aura contracted and continued to do so for 15 more hours, when PIMAT was discontinued. Within the next 9 hours the aura regained its original shape. The experiment was terminated at 10.00 hours on 19th June 1991. The person subjected to the experiment did not make any complaint throughout the duration of the experiment. The material under investigation is clear confirmation of how PIMAT affects the human organism, although a more extensive study on a larger population is recommended. – PIMAT (in its cloth version) can be used as a ‘first aid’ radiaesthetic screen; nevertheless its insulating effectiveness should be further determined. – PIMAT has a favourable effect on the human aura; however, its usefulness for the human organism should be individually determined (by radiaesthetic means for example) since the tests that have been carried out indicate no changes in the aura within a given time period. Therefore, a larger group of subjects with different auras should be tested with a greater number of PIMAT cloths. – No unfavourable effects of PIMAT on individuals were detected; therefore PIMAT may be considered to have a benign impact on the human organism. Reports from PIMAT users on the product’s therapeutic action gave rise to the hypothesis that it affects microorganisms responsible for certain diseases. Research in the Microbiology Laboratory of the School of Medicine in Szczecin was started in October 1992. Statistical analysis of the results confirmed beyond any doubt that PIMAT has an effect on the growth of bacterial strains. Research carried out in the Microbiology Laboratory of the School of Medicine in Szczecin. PIMAT is a square of linen cloth measuring 18cm x 18cm, with dots specially inscribed on it (see enclosure 1). Ryszard Olszak, the inventor of PIMAT, registered his product at the Polish Patents Office in February 1991 as an “Electromagnetic Field Generator” (claim no. 289128). According to the inventor of PIMAT, its action is based on the energizing effect of a geometrical configuration (EEKG – the name produced by Professor J Mazurczak, or neoenergy, the name brought into use by Dr S.V. King). EEKG or neoenergy is the effect of shape (geometric configuration) on matter. It should be underlined that in spite of a great deal of research having been carried out, the nature of this phenomenon has not yet been explained from the physical point of view, i.e., has not been measured by conventional methods. For the characteristics and evaluation of neoenergy, radiaesthetic colours are used. Radiaesthetic colour is an agreed-upon notion meaning that a given wavelength corresponds to a particular colour. PIMAT is defined as a ‘regenerator of energy’ (regenerator of vital forces). This results from the fact that PIMAT generates the whole spectrum of radiaesthetic colours necessary for a human being to maintain its health. The additional feature of PIMAT is the wave emitted that counteracts harmful radiation and neutralises the radiation characteristic of watercourses (1). The beneficial action of PIMAT is confirmed by the expert opinion of J. Wilczewski of the Biotronic and Electrophotographic Laboratory at Kielce, reached in the course of his electrophotographic tests, and also by other radiaesthetic reports. Many people using PIMAT have informed us about the additional energising and curative effect of the invention upon their systems. All the above-mentioned facts have resulted in the hypothesis that PIMAT also exerts its influence on microorganisms. This action could be responsible for the curing of human ailments. The aim of the present research was to examine the effect of PIMAT on the growth of selected strains of bacteria and yeast. Strains isolated from patients at the Regional Hospital Complex No 1 in Szczecin were used for the test. A) Enriched broth manufactured by the Vaccine and Serum Institute in Warsaw. A) Enriched agar manufactured by the Vaccine and Serum Institute of Warsaw. All the media were sterilised for 20 minutes at 117oC. Pure cultures of individual species of organisms were used for the tests. When an 18-hour culture was obtained, it underwent several dilutions in liquid media, with geometric progression from 10-1 to 10-6. 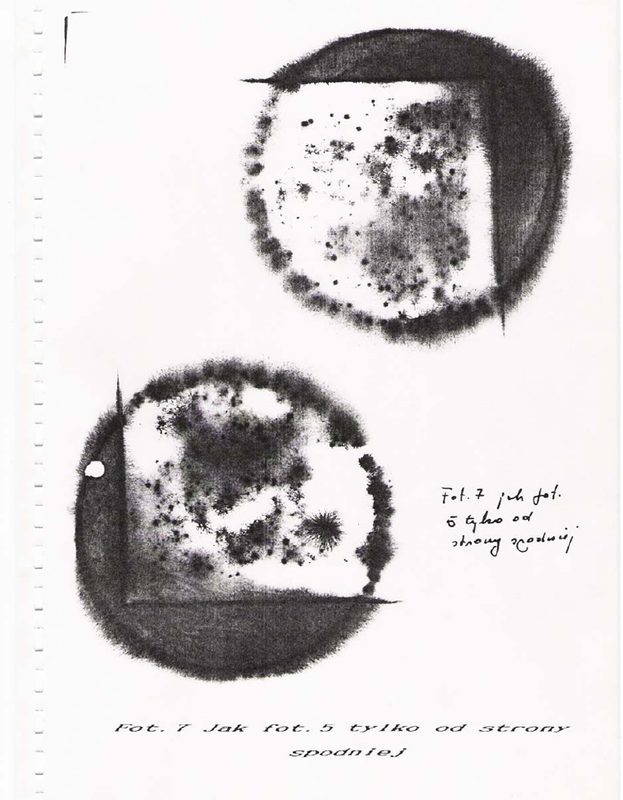 To avoid mistakes, samples of a given stage of dilution were divided into two, and thus series of the same density were obtained for testing and control (see Fig, 1). The 10-6 dilution was used to make qualitative samples on solid media, which, after a 24-hour incubation period, served to determ15. Effect of PIMAT on development of crayfish, ine the density of a given culture as a stp class=”style8″ style=”text-align: left;”arting point. The series of dilutions tested was incubated for 24 h at 37oC or 28oC under the influence of PIMAT. The control series of dilutions was incubated under the same conditions, in a separate room without PIMAT. After incubation, the rate of growth and its nature were examined and a quantitative evaluation was made by means of inoculation on the solid medium. In addition, the density of suspended solids in both samples was determined. – quantitative determination of rate of growth of the test and control samples and comparative analysis. In the first stage of the research, tests on solid and liquid media were made. The results of the effect of PIMAT on the growth of microorganisms on solid media were very difficult to interpret and accordingly further research was concentrated on the influence of PIMAT on liquid cultures. 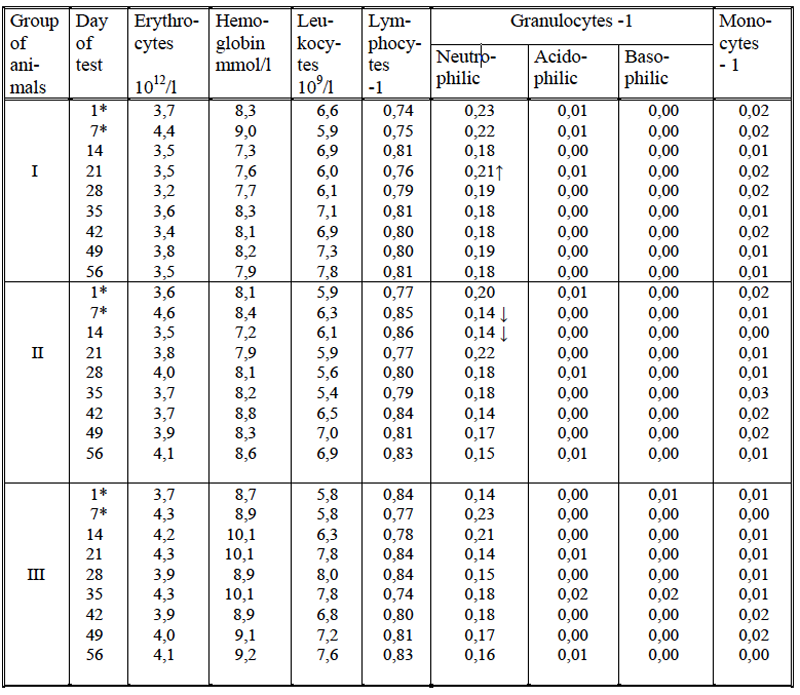 The findings concerning the effect of PIMAT on the growth of selected species in liquid cultures are shown in Table 1. In addition, the table includes the series of tests the results of which varied considerably from those obtained earlier. Since there was a suspicion that this series of tests was performed with the use of a PIMAT sample defective from the radiaesthetic point of view, special attention was paid to the experiment. 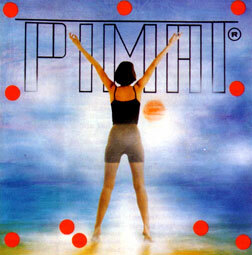 The inventor of PIMAT did not know why the preparation was to be tested. In the end, it was found that this PIMAT sample was radiaesthetically useless. Among other things, it was found to have red stains, in addition to the typical red dots, which destroyed its shape. Microorganisms, like all other organisms, are constantly influenced by a variety of environmental conditions. However, not all of them react to a given factor in the same manner. Their outstanding feature is great tolerance of a variety of external influences. The effect of different physical and chemical influences is well known and of great importance. Such factors are temperature, osmotic pressure, surface tension, pH, ultrasonic wave action and various kinds of radiation. The PIMAT cloth is a configuration of points on a plane, which emits the energy of shape. The operating mechanism of that energy is still unknown. It is possible that initial research, the results of which are presented here, will serve as a starting point for the determination of the energy of shape. During the tests all the species were subjected to similar conditions necessary for their growth. This means that the influence of different external conditions was eliminated. That is why the results are comparable and indicate that the energy of shape affects the growth of selected bapcteria. The action depends on the species: it is stronger in the case of S.aureus, S. pyogenes, and P. aeruginosa, moderate in the case of C. albicans and weaker in the case of E. coli. 2) to determine the influence of PIMAT on the course of the humoral and cell-mediated response of the system to bacterial, mycotic and viral diseases. 3) because of the greater sensitivity of protoplasts and spheroplasts to the action of external factors, to define the influence of PIMAT upon such subjects and its effect on their reversability. Such research should make it possible to recognize changes in particular cellular structures under the influence of the energy of shape and to find the analogous conditions for the operation of given ranges of electromagnetic wave spectra. 4) to determine the possible influence of PIMAT on the course of the mutation of genetic material, which may result in the correction of biological features of microorganisms. The research described in Chapter III was repeated at the Principal School of Agriculture in Warsaw. The same experimental procedure and methodology were employed. In addition, the results were subjected to statistical analysis. Statistical elaboration of the experimental results was done by way of double-factor variance (ANOVA 2), with the use of PIMAT as one factor (at two levels: A1 + PIMAT; A2 – PIMAT) and bacterial species as the other (at 10 levels B1 – B10). Different reactions of bacterial species to the presence of PIMAT were found. Certain species (Staphylococcus aureus B1, B2; Pseudomonas sp.B5, B6; E. coli B7, B8) were statistically confirmed to breed more slowly in the presence of PIMAT than without it. However, in the case of the other bacterial species examined (Bacillus s. B3, B4; Candida sp. B9, B10) no statististically significant difference in the growth of the microorganism was observed with or without PIMAT. All living cells are subject to mutation. The cell, however, is not passive to these changes. The research described below revealed that PIMAT can help to intensify the cell’s defensive reaction against certain carcinogenic mutagens. The number of revertants evoked by various mutagens is reduced (the reduction being statistically significant) in the presence of PIMAT only in the case of certain mutagens. This conclusion applies both to the TA97 and the TA98 strains. A statistically significant reduction in the number of revertants was noticed in the TA97 strain exposed to PIMAT in relation to two mutagens: DOWMYCIN and BENZOPYRONE. For the TA98 strain a statistically significant reduction of revertants exposed to PIMAT was noted in relation only to DOWMYCIN. 3. Comments on the analysis: “Effect of PIMAT on the mutagenic action of selected chemical compounds measured with the Ames test”, made by the Principal School of Agriculture, Warsaw. In the analysis histidine-dependent strains were used. They were exposed to mutagenic factors of various concentrations for 16 hours. After this period of time, comparable numbers of cultures were quantitatively and qualitatively evaluated as to the mutational, genotypic and phenotypic changes that had taken place. Tables 1 and 2 show the number of revertant cells mutagenically changed in the 10-5 concentration. TA 98 Salmonella typhimurium test strain. TA 97 Salmonella typhimurium test strain. The statistical evaluation of the results irrefutably confirms that the presence of PIMAT reduces the mutagenic action of certain mutagens. Each of the standard strains reacts idiosyncratically to various mutagens and each of them impedes the action of mutagens to a varying degree. In the case of the TA97 Salmonella Typhimurium strain, it was found that in the presence of PIMAT the reduction of the mutagenically modified revertants in relation to Dowmycin and Benzopyrone was statistically significant; in the case of the TA98 Salmonella typhimurium strain, the reduction was statistically significant in relation only to Dowmycin. The subject of the evaluation was the product called “PIMAT Regenerator of Energy”. The PIMAT RADIAESTHETIC ARTICLES COMPANY, Osiedle B. Chrobrego 1/215, and PL 60-681 Poznan, Poland commissioned the evaluation. The PIMAT Regenerator of Energy is a square cloth made of white cotton fabric, measuring 18 cm x 18 cm and having red dots of 1 cm in diameter, as well as the word PIMAT, printed on it. – mental, by regulating the work of the nervous system. As an object of personal use, PIMAT should be placed printed side up in the bed, under the sheet, underblanket, or mattress (no thicker than 25 cm) at the level of the sacral region. Regardless of the position of the user during sleep or relaxation, PIMAT does not lose its potency of action unless physically damaged. PIMAT can be laundered at temperatures of up to 40o C and ironed. PIMAT was tested for three months by a group of Bioenergy Therapy and Radiaesthetic Experts from the Polish Psychotronics Society. PIMAT was examined by methods of radiaesthetic measurement, as well as during regular usage according to the inventor’s instructions. PIMAT cloths were also given to a group of persons currently in bioenergy treatment; they all suffered from a variety of ailments and were considered particularly sensitive. Of this group, eight persons were not aware of the presence of PIMAT – the cloths had been placed in their beds secretly to eliminate autosuggestion in the informants. No unfavourable action of PIMAT was found throughout the duration of the test. The radiaesthetic measurements carried out confirmed that the geometrical pattern formed by the red dots on the cloth square generates so-called radiaesthetic colours, i.e. energy waves of a definite length which influence the human system. The inventor of PIMAT made use of the shape radiation phenomenon that is well known and has been extensively described in radiaesthesia. PIMAT generates energy waves described in radiaesthetic terms as radiaesthetic colours. The further measurement results presentsed are mean values, the measurements being done with a variety of biometers and other well-known radiaesthetic methods. The intensity of wave radiation is strongest within the 50 cm diameter range. From the point of view of chromotherapy, the energy waves emitted affect the human system by purifying and tonifying it (positive green), by exerting an analgesic and anti-inflammatory influence on it (blue), by invigorating (orange), and stimulating it (red), and by tonifying the nervous system (indigo). The action of PIMAT is too weak to combat the harmful radiation that may occur. The average intensity of harmful radiation from an average watercourse is 30 units (SRW scale) within the range of one meter. In housing blocks, however, the average intensity of these radiations is 3 to 4 times greater. In order to neutralize such radiation, a radiation of equal or higher intensity and of an adequate wavelength should be generated, or it should be possible to transform these energies. Measured on the SRW scale, the intensity of the radiation emitted by PIMAT is 0.75 to 3 units – a correct value for PIMAT to affect the human system favourably (uninterrupted emission). PIMAT cannot, however, transform or divert harmful external radiation. – no action that would neutralize harmful geopathic radiation, or that would protect against it. – on a person’s blood pressure. PIMAT should be placed as close as possible to the body (preferably under a sheet or underblanket in the bed). The Polish Psychotronics Society hereby grants certification to the PIMAT Regenerator of Energy. This certificate is issued for the specimen of PIMAT as described in point 1 of the present document. It is recommended that instructions for use should accompany the product. The Polish Psychotronics Society should be notified of every modification introduced into PIMAT by its inventor, so that the Society’s experts can reevaluate the product.
. IntroductionAs commissioned by the PIMAT Radiaesthetic Articles Company in Poznan, an analysis of tap water exposed to active PIMAT cloths was made. As required by the commissioning party in the contract, a control tap water sample was taken and stored for the two weeks’ duration of the experiment for final parameter comparison. The water for the tests was tap water sampled in the building of the Department of Construction and Architecture, Szczecin Technical University, on 30 January 1992. The volume of the water sample was 10 dm3. This quantity was next poured into three sterilized two-litre clear glass laboratory flasks. The remaining quantity of water was used for water analyses. Two of the three water samples were placed on active PIMAT cloths so that the bottle bottoms were in the field of the ten red dots marked at the edges of the cloth. The third bottle was left in the same conditions of light and temperature as the two others, about 5 m away from them. The experiment lasted two weeks. Water viscosity increased by 8.1% under the influence of PIMAT as opposed to controls. Concentrations of sulphate, nitrate and iron changed in relation to control by 19.1%, 7% and 15.5% respectively. (See Tables 1/VII and 2/VII and charts A, B, C, D). The survival rate of bacteria in tap water under the influence of PIMAT was also measured: based on the results obtained it can be claimed that PIMAT may be used to make water safe for drinking. This research was undertaken at the Microbiology Department of the Faculty of Natural Sciences of Szczecin University, ul. Felczaka 3A, Szczecin. It concerns the evaluation of the impact of PIMAT on certain immunological and haematological parameters in rabbits (part 1), and the influence of PIMAT on immunological parameters in rabbits infected with RHD (Rabbit Haemorrhagic Disease), a virus typical of the species (part 2). Issued by the Microbiology Department of the Natural Sciences School, Szczecin University, Szczecin (Poland). As the Chlamydia Trachomatis and the Chlamydia Psittaci latent infections are on the rise in the human population, a study was carried out to investigate the effect of PIMAT on the immunity to these two antigens. The experimenters focused on selected indices of specific and nonspecific immunity tested on laboratory animals (rabbits). The study revealed that the immunity systems of the rabbits reacted positively to the afore mentioned antigens, the changes being statistically essential. Therefore, it may be assumed that people will react in a similar manner to these antigens. The effect of PIMAT on the immunological reaction of rabbits immunized with the inactivated Chlamydia antigen. The goal of the experiment was to define the changes in the dynamics of the hematologic and immunological indices (see a similar study – Part I) in the following groups of rabbits : (1) immunized with Chlamydia and ‘placed’ on a PIMAT, (2) immunized with Chlamydia and not exposed to PIMAT, (3) a control group, i.e. one that was neither immunized nor exposed to PIMAT. At this stage of the experiment clinical symptoms in animals were being monitored and recorded; moreover, the degree of infection was being observed ( clinical and serologic tests), and the temperature and humidity of the environment in which the rabbits had been put were being recorded. The animals were rabbits, same as described in Parts I and II, of the present work. They were kept in like cages, the only difference being that throughout the experiment they stayed in the vivariums of the District Hospital Complex in Gorz6w Wielkopolski and of the Microbiology Department, Szczecin University, Szczecin. The feeding, watering and general care were the same as described in Parts I and II. At this stage of the experiment the rabbits were also healthy and did not show any deviations that would indicate a disease. The PIMAT used was identical to the one described in Parts I and II. a) The antigen with which the animals were immunized was the Gocaltowo 5082 EP-4-EP7 Chlamydii Psittaci strain suspended in physiological saline. The strain had been inactivated with formaldehyde, in accordance with the Czechoslovak procedure (Travnicek 1991), and it contained 25 μq/ml of corpuscular antigens. In this part of the experiment, tested were 30 rabbits, further divided into three groups (labelled I, II and III) – 10 subjects in each. Group I included 10 rabbits hypodermically injected with 10.0 ml (5 ml x 2 , at seven day’s intervals) of the Chlamydia antigen each . These rabbits were kept in cages with PIMATs (see Part I). Group II were again 10 rabbits immunized with the Chlamydia antigen like the subjects in Group I, but placed in another room in cages with no PIMATs in them (see Part I). Group III included 10 control rabbits kept in still another (third) room in cages with no PIMATs in them. The animals were hypodermically injected with a 0.9% saline solution (NaCl) in the exact amount and following the exact procedure as was the case in the administering of the Chlamydia antigen in the other two groups. At this stage of the experiment the injections were given to the animals directly after blood samples from those animals (Groups I-III) were taken. Thus, two groups (I and II) were injected with the Chlamydia antigen and one group (III) was injected with saline solution. Next, all of them were put into specially prepared cages with PIMATs (Group I) or without PIMATs (Groups II and III). Because of such factors as (1) the characteristics of the parameters under the present study (see Part I), (2) the intracellular parasitism of Chlamydia after entering a living organism and (3) the assumption that serologic tests -i.e. observations of the changes in antichlamydia antibodies -are essential, blood samples were taken consecutively on the following days of the experiment: 1st, 7th, 14th, 21st, 28th, 35th, 42nd, 49th and 56th. The clinical, hematologic, immunological and statistic tests, as well as the test to determine the bioclimate of the rooms where the rabbits were kept, were performed by the same methods as the ones described in Part I. In addition to the above listed tests, also serologic tests were carried out. The antibodies for the Chlamydia Psittaci in the rabbits’ serums were marked with the complement fixation test (CFT) for the Dessau Company (Germany) antigen, according to Instruction No. 46 of February 22, 1979 written by the Veterinary Medicine Institute in Pulawy (Poland) and issued by the Veterinary Medicine Department of Poland’s Ministry of Agriculture. The tests were administered in solutions 1:2, 1:4, 1:8, 1:16, 1:32 and 1:64, and – in agreement with the above quoted instruction -the 1:16 and higher solutions with no hemolysis taking place /++++/ were considered positive results. The results of the present experiment are given in tables 1-4/V. They reveal that the results of the hematologic, immunological and serologic tests performed on the rabbits in Group I are effects of the action of the Chlamydia and PIMAT; in Group II, they are the effects of the action of the Chlamydia. The clinical tests (see table 4/V) fully confirm the thesis that the antigens used do not cause any pathologic changes in the animals under the present study (Groups I, II and III). Moreoever, the tests on the bioclimate – i. e. temperature and humidity – of the experimental rooms – fall within the nationwide standards for rabbits (as specified in: the Chart of the Zootechny Institute, 1980; Kwasniewski, 1986; Wieclaw et al, 1990). This latter fact proves that the changes obtained in the immunologic, hematologic and serologic parameters in the rabbits in Groups I and II, as opposed to Group III, resulted from the action of the two experimental factors, that is the Chlamydia antigen and/or the PIMAT regenerator. Therefore, when analyzing the values of the parameters displayed in tables 1-3/V, one can see that they are highest in the rabbits in Group I, quite distinct in the rabbits in Group II, and lowest in the rabbits in Group III (i.e. the animals that were not exposed to the action of PIMAT or the Chlamydia Psittaci antigen). 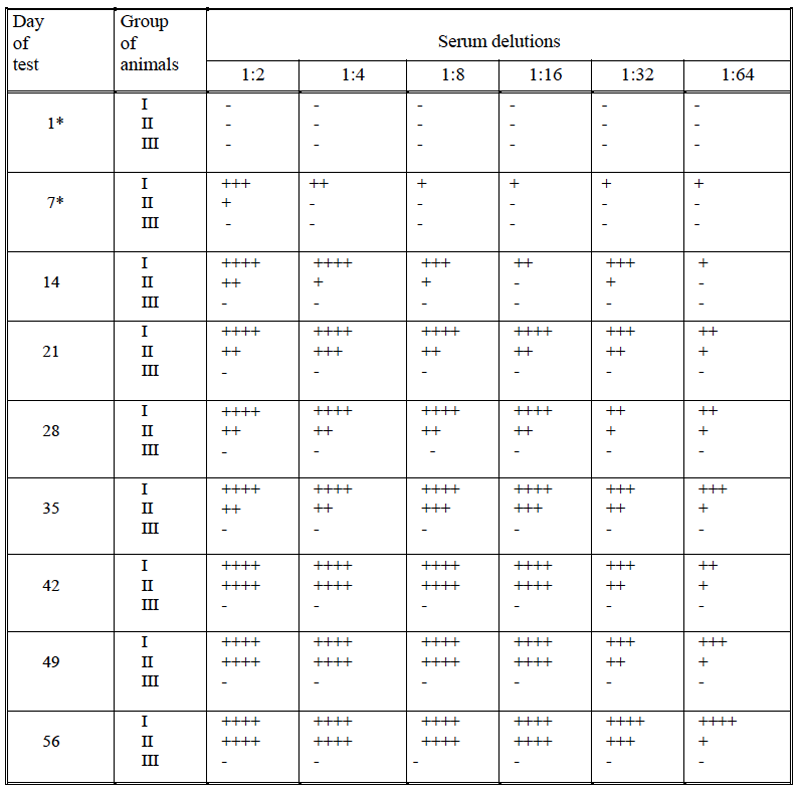 A detailed analysis of the parameters observed in the group I rabbits, in comparison to the control group (III) animals, revealed that a stable, statistically valid increase started as early as the 7th to 14th day of the experiment and the growth was observed in almost all immunological indices, i.e. those indices which represented both the nonspecific cellular and humoral immunity, and the specific humoral immunity as well (evluated on the basis of the amount of serum immunoglobulins. This increase continued until the 42nd-56th day of the observation, that is the end of the experiment. In comparison to the identical parameters specified for the rabbits in Group II, i.e. the ones exposed to the Chlamydia antigen only, the changes in Group I are by far bigger and more regular, and they start several weeks earlier and continue (in all cases) 1-2 weeks longer (see table 2). It may be thus concluded that the growth in the immunological parameters in the animals under investigation took place because of the presence of PIMAT. These findings prove that PIMAT has a positively stimulating effect on a rabbit’s immune system , even when the rabbit is infected with an extremely latent virus ( see Parts I and II). Table 2/V (immunological tests results) and table 3/V (serologic tests results) show again that PIMAT has a stimulating effect on the immunity system, even if it is ‘burdened’ with as complex an antigen as Chlamydia. Table 3/V proves beyond any doubt that it is the PIMAT regenerator that very distinctly stimulates the synthesis of the specific anti-Chlamydia antobodies, which fact is the fundamental testimony that the PIMAT regenerator is very effective in stimulating the specific antidisease immunity. Moreover, it is worth noting that the regenerator not only triggers a larger synthesis of the antichlamydia antibodies, but that this synthesis takes place almost 4 weeks earlier (see table 3/V) than in the case of the animals stimulated exclusively by the Chlamydia antigen (see table 3/V for the time of appearance of the positive titer in the antibodies of the antichlamydia in Groups I and II). To conclude the description of the effect of PIMAT on the rabbits’ immune systems, it should be mentioned that the results obtained in the present experiment on the immunization of animals with Chlamydia are extremely interesting and valuable in view of the increased numbers of Chlamydia induced infections in people and animals that have been observed not only in Poland but also woorldwide (cf. Moulder, Marth, Ruczkowska, Choroszy-Krol, Zdrodowska-Iwanov, Zgorniak- Nowosielska, Deptula et al.). It should also be noted that in spite of numerous new technigues, diseases caused by these viruses are still difficult to diagnose (especially if they are latent), treat and prevent from. The overall picture obtained from the present study with PIMAT and the Chlamydia antigen seem to open new prospects for the fight against Chlamydia, which causes so many diseases in people and animals and which is so difficult to treat. (3) in the control group (Group III). The antichlamydia antibodies titer in the CFT in the three groups of rabbits tested. Table 3/V The antichlamydia antibodies titer in the CFT in the three groups of rabbits tested. The clinical condition of the rabbits and the temperature and humidity values in the rooms in which the animals were kept. 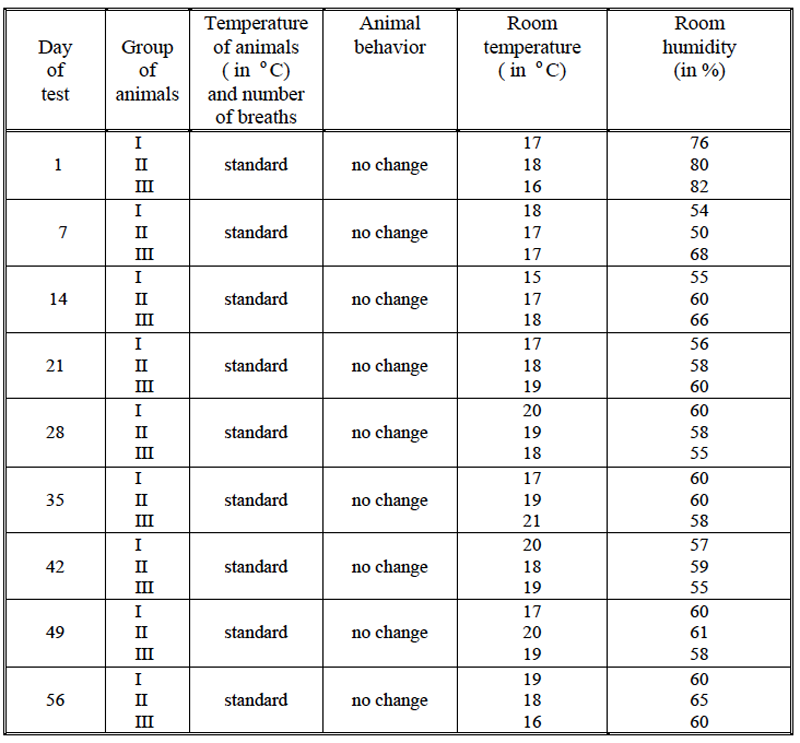 Table 4/V The clinical condition of the rabbits and the temperature and humidity values in the rooms in which the animals were kept. 1. The regenerator of vital forces, named PIMAT, which is the subject of the present study, improves – to a statistically valid degree – the immunity of rabbits immunized with Chlamydia Psittaci. 2. Under the present study, the growth in the activity of the immune systems of rabbits immunized with as complex an antigen as Chlamydia shows that PIMAT affects the immunity system not only in a general, but also essential and specific way. XII. RESEARCH ON EFFECTS OF PIMAT ON CHOSEN PLANTS AND ANIMALS – CARRIED OUT AT FACULTY OF GENETICS, UNIVERSITY OF SZCZECIN. Beginning in October 1992, studies have been conducted by a team headed by Professor Roman Zielinski, Ph.D., at the Faculty of Genetics, University of Szczecin. The studies aimed at defining the effects of PIMAT on the tested organisms and choosing representatives of aquatic flora and fauna most sensitive to the PIMAT action. Below, the entire experimental material is presented with its results, documenting the stimulating effect of PIMAT on the subjects studied. It should be mentioned that a proportion of the experiments failed to confirm the correlation between the presence of PIMAT and the changes taking place in the organisms studied. – determination of the germination course for wheat and rye under conditions of stress in the presence of PIMAT. A number of observations were made concerning the behaviour of fish and crayfish inhabiting the neighbourhood of PIMAT. Their reactions were also filmed. – fish and crayfish preferred to stay above PIMAT, which had been placed beneath the aquarium, throughout the period of the experiments. – under the influence of PIMAT, fish exhibited a more pronounced accumulation of pigment cells, which acquired an almost spherical shape. This may indicate that PIMAT stimulates fish to an earlier reaction to stress. b) PIMAT sheet examined for the type of its radiaesthetic activity of equal intensity, free from emanations originating from the Hartman grid were suitable for conducting the experiments. The first complex radiaesthetic studies were performed on 3 January 1993 and they were repeated on 6 January, 12 January, 16 January, 22 January and 28 January 1993.
a) no emanations were detected which might have origininated from underground streams, geological tunnels, water pipes, etc. c) the localization of sites free from Hartman grid – the emanation was determined (see Figure) pointing to their suitability for the PIMAT experiment. d) the intensity of the emanation was variable (+- 20% average intensity) and the cause of these variations remained unidentified. The experiment aimed at determining the effect of PIMAT on the increase in the number of Cyanophyceae of Microcystis genus in the course of their 10-day culture in the aquarium. Water for the culture originated from Bylic Male lake, belonging to eutrophic lakes in its autumn post-mixion period. The PH of the water from the lake was adjusted to 9.0 using Ca (HCO3)2. The cultures were run in aquaria, at a room temperature of 20-22O C and in natural room light. To increase the water content of CO2 the cultures were bubbled. The number of Cyanophyceae estimated by estimating algal units (1 algal unit, a.u., corresponded to 20 Microcystis cells) and by determining the volume of Cyanophyceae in Inhoff funnels. Three experiments were performed, each including samples with and without PIMAT. Six aquaria, each 10 litres in volume, were seeded with Cyanophyceae in the amount of 6 million a.u.. Three aquaria were underlayered with two PIMATs each while the remaining three aquaria served as a control. The results are listed in Table 1/XII. In each aquarium over PIMAT the biomass produced was on average 220% greater compared to the aquaria with no PIMAT under them (biomass expressed in a.u.). 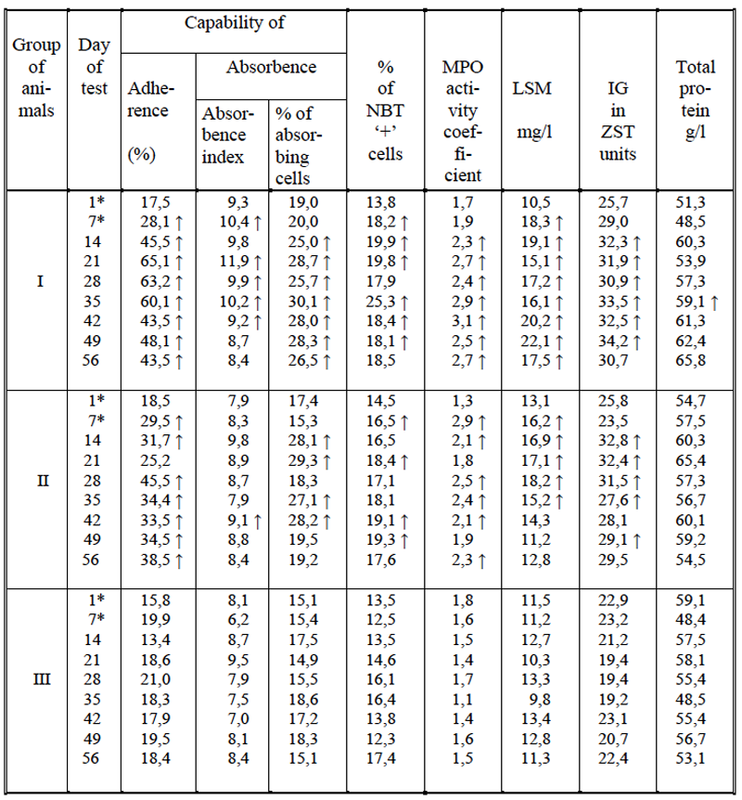 The volume of algae in aquaria with PIMAT was greater by 24% (Table 1/XII). Two aquaria, each 20 litres in volume, were seeded with 3 million a.u. per litre. Two PIMAT sheets were placed under one of the aquaria. In the aquarium over PIMAT 2000 million a.u. were obtained while the control aquarium yielded only 900 million a.u. (Table 1/XII). Two aquaria, each 50 litres in volume, were each seeded with Cyanophyceae at 3 million a.u.. Under one of these six PIMATs were placed. The aquarium yielded 2500 million a.u. and the control aquarium only 500 million a.u. (Table 1/XII). Analogous results were obtained in experiments I to III, pointing to the stimulating effect of PIMAT on the increase in the cell number of Cyanophyceaein the course of their 10-day aquarium culture. In experiments I and II, the increase amounted to 220% and in experiment III, it was even 500%, giving an average advantage to PIMAT cultures of 310%. Microcystis genus Cyanophyceae seems to represent promising material in studies on the effect of PIMAT on biological subjects. The experiment was performed on monocellular algae of Scenedesmus sp. of Chlorophyta group in order to determine its growth rate in the presence and in the absence of PIMAT. 200 cm3 medium, prepared according to the earlier given procedure as for cultures of water thyme, was placed in each of 10 beakers, each of 400 cm in capacity. In each beaker the medium was seeded with the same, small amount of algae of Scenedesmus sp. (approximately 0.5 million algal units). Five beakers with Scenedesmus cultures were placed on glass-covered PIMAT while the other five cultures were placed over control sheets. The two groups of beakers were placed in separate incubators, of identical temperature (240 C) and light conditions. The algae were cultured for 14 days using bubbling of the cultures with air to supplement CO2. Following 14 days of culture, the quantity of the biomass was estimated by measuring medium transparency using Snell’s instrument and the counting of algae as described by Zadin (1966). The data are shown in Tables 2, 3/XII. After 14 days of culture, the biomass of Scenedesmus was definitely greater in cultures in the presence of PIMAT, as indicated both by transparency measurements and by the counting of algae. Culture transparency, calculated as an average value between two extreme estimates amounted to 3.75 (extreme values 2.0 and 5.5) in cultures in the presence of PIMAT and 13.75 (extreme values 7.5 and 20.0) in cultures in the absence of PIMAT. Thus, the difference reached approximately 360%. The number of algae in the cultures was decisively higher in the presence of PIMAT, which is fully consistent with earlier results. The mean difference in the number of algae in the experimental set-up with PIMAT and that without PIMAT was 600% with the advantage to the former. In the experimental set-up with PIMAT, samples 4 and 5 were positioned beyond the edge of PIMAT. Visually, the samples differed from the remaining three cultures standing above PIMAT by being more lightly green, which was later confirmed by the results. The observation seems interesting as it may point to the effect of PIMAT on the biological subject being variable, depending upon its distance from PIMAT. The experiment was planned with the idea of suggesting a simple experimental system which could be used by interested persons to re-examine the PIMAT action, requiring no particular biological knowledge or laboratory conditions. The material originated from a bottle used for watering plants. The sediment on the bottom of the bottle includes Diatomae and algae which, used for a further culture, develop in layers. The sediment can be washed out of the bottle and, after mixing, can be used to seed beakers/jars with boiled water at room temperature. The jars can be placed close to the window in the set-ups with and without PIMAT. After a few days, up to a week, the outgrowth appears, the intensity of which may be estimated with the naked eye. In our experiment, we have seeded the suspension from the bottom of the bottle in 10 beakers, half of which were cultured in the presence of PIMAT while the rest served as a control. Biomass increase was estimated using algal units. As compared to the PIMAT-free system, the PIMAT set-up showed an increase in biomass of 30% (Table 4/XII). Before recommending the experiment, it/sup should be repeated a few times. The experiment aimed at determining the effect of PIMAT on the rate of green mass growth in Spirogyra, attempting to correlate it with the uptake of orthophosphate and nitrate ions from the medium. Approximately 0.5 g algae were cultured in Pratt’s medium, consisting of 0.1 g KNO3, 0.01 g K2HPO4, 0.01 g MgSO4.7H2O-0.01 g, FeCl3 .6H2O-0.01 g, supplemented with the settled tap water to 1 1itre. The algae were cultured in glass beakers, in 200 ml medium. Five beakers were placed on PIMAT while the other five were incubated /subwithout PIMAT. The cultures were kept in a room, in identical temperature and light conditions. Green mass increase was monitored using an electronic top-loaded balance, while amounts of orthophospates and nitrates were established according to the Polish Norm PN-89, C-04537/02 and PN-73, C-64576. The cultures were set up on 15th December 1992. The first weighing was conducted on the same day and the last one on 7th January 1993 (Table 5/XII). Ion levels were measured for samples 1 to 5 with PIMAT and, separately, for samples 1 to 5 without PIMAT, for each group, on 11th January 1993. The growth rate of Spirogyra algae was five-fold higher after one month of culture in the presence of PIMAT. In the presence of PIMAT, weight increase in green mass ranged in various samples between 0.153 g and 0.487 g. In the absence of PIMAT, the increase ranged from 0.012g to 0.119 g (Table 5/XII). Cultures kept in the presence of PIMAT exhibited a greater takeup of orthophosphates and nitrates from the medium. Cultures kept in the presence of PIMAT and those without PIMAT contained between 0.63 and 0.97 mg PO4/1 and 0.24 and 0.37 mg NO3/1, respectively (Table 6/XII). The results point unequivocally to the effect of PIMAT on the growth rate and takeup of the analyzed ions. However, responsible scientific research as to the effect of PIMAT on the experimental set-up described above with Spirogyra would require that the experiment be conducted three times and the experimental system broadened by circadian characteristics of the analyzed ions, pH and redox potential of the medium. The developmental cycle of Drosophila melanogaster was studied in the presence of PIMAT and without PIMAT. For the experiments a wild strain of fly was used, the cultures of which were set up to obtain larvae and pupae. The latter were isolated and placed separately in bottles with the medium. The cultures were kept in the presence or absence of PIMAT, in separate incubators at 25O C.
6.1 A total of 48 larvae were isolated and kept individually in small bottles with the medium. Twenty-four of the larvae were cultured in the presence of PIMAT and 24 larvae in its absence. In the presence of PIMAT, the larvae yielded 23 pupae and, later, 21 mature flies, while the respective numbers in cultures without PIMAT were 20 and 19. The differences in numbers of pupae obtained in the presence as compared to absence of PIMAT (95.8%, vs. 83.3%) were statistically insignificant. Also the difference in the number of mature flies obtained from 24 larvae in the presence or absence of PIMAT (87.5% vs. 79.2%) or obtained from, respectively, 23 and 20 pupae, respectively (91% vs. 95%) are insignificant. 6.2 One hundred and sixty one pupae were isolated and cultured in separate bottles in the presence of PIMAT, while 146 pupae isolated in the same way were cultured in the absence of PIMAT. In cultures with PIMAT present, 142 mature flies were obtained from 161 pupae (88.2%) while in cultures without PIMAT 146 pupae yielded 122 mature flies (83.5%). The difference is significant as evaluated by the chi2 test. Significant differences were detected in the rate of fruit fly pupation. In the culture with PIMAT, pupation was much slower and was most pronounced on the sixth day from the time of placing the pupae in the medium. In cultures without PIMAT, pupation rate was twofold higher in the first three days of pupation (days three to five) and it decreased beginning on the sixth day of culture (Figure 1/XII). The absolute and relative data illustrating fruit fly pupation rate in the experiment are shown in Table 7/XII. The experiment aimed at determining the differences in settling on an artificial substratum, in the form of appropriately prepared boxes, of invertebrate animals in the course of half-year long exposure on the lake bottom. The boxes were made of pine boards and their dimensions were 20 x 26 x 21 cm. On top they were covered with a net to prevent invertebrate animals assembling in the boxes from being preyed upon. The bottom of each box was covered with crushed gravel, which provided substrata for the settling animals. In the PIMAT version, the PIMAT was packed into a foil bag and placed under the gravel (Photograph 1). In the version without PIMAT the foil bag alone was placed under the gravel (Photograph 2). The experiment was performed in three replicas. The boxes were placed at a depth of 2 m, at the bottom of Insko Male Lake, just behind the reed range, in November 1992 and they were exposed till May 1993. The mean results for the three replicas are shown in Table 8/XII. The numbers of individuals of given species were definitely higher in the version with PIMAT. Also the biomass was much greater in each of the species in the version with PIMAT. Moreover, the markedly greater density of inhabitation by algae of the net, which covered the box, in the PIMAT version as compared to the version without PIMAT, drew the attention of investigators (Photographs 3 to 5). PIMAT stimulates the settling of aqueous invertebrates on artificial substrata and induces an increase in their biomass. The aim of the experiment was to determine the effect of PIMAT on blood pH in Crucian carp subjected to a stress factor in the form of toxins secreted by cyanophyceae of Oscilatoria sp. Blood pH in fish decreases under stress as could be demonstrated more than 10 hours later, by analysing blood from the tail vein. In Crucian carp, blood pH in aquarium conditions (time point 0) ranged between 7.5 to 8.0 and decreased to around 7.2 under the effect of cyanophyceae toxins. It was assumed that a factor of the PIMAT type might alter the reaction of the fish to stress. For the experiment, uniform fish were used, originating from a single litter, each weighing 7.4 +/- 0.2 g. All the fish were healthy. The original biomass of Oscillatoria sp. in the experiment was 3.52 mg/dm3. The biomass of cyanophyceae was checked every two days. The quantity of the biomass was established by chlorophyll technique. The experiment was conducted in an aquarium, 30 x 60 x 120 cm in size, divided into two equal parts by a septum, which prevented the migration of fish only. PIMAT was placed in one half of the aquarium (Photographs 1,2). Each half of the aquarium was stocked with 5 fish. The experiment was repeated, analysing a total of 20 fish. Blood pH was examined after 14 days of the experiment. The habitation of crustacean carps in water conditions with cyanophyceae (version without PIMAT) induced stress reaction to cyanophyceae toxins in the form of a decrease in blood pH to 7.265. PIMAT caused further decrease in blood pH to 7.035, the difference being statistically significant (see Table 9/XII). It is worth adding that during the experiment about 20% of the fish in the group affected by Oscillatoria sp. but not exposed to PIMAT died (every dead fish was replaced by a new one), whereas all the fish from the group affected by Oscilatoria sp. and exposed to PIMAT survived the 14 days of the experiment. It was statistically confirmed that the difference in the blood pH parameters in the crucian carp exposed to the cyanophycea toxins of the Oscillatoria sp. type was significant when the fish were or were not exposed to PIMAT. The cyanophyceae toxins decreased the value of blood pH from approximately 7.5 to 7.265. With the additional effect of PIMAT, blood pH dropped further from 7.265 to 7.035. By making fish sensitive to unfavorable conditions of the environment, PIMAT reinforces the stress action of toxins. It was observed that in the absence of PIMAT 20% of the fish died because of their exposure to the cyanophyceae toxins, whereas in the presence of PIMAT no deaths were recorded. This observation proves that PIMAT improves the immunity of an organism to unfavorable conditions in the environment. The experiment on the effect of PIMAT on gammarus behaviour was performed in an aquarium, 25 x 40 x 30 cm in size. PIMAT was placed under one half of the aquarium bottom and white paper was placed under the other half. Gammarus were placed in a bottle of dark glass with two identical openings (Photographs 1, 4, 6, 7). The bottle was placed in the aquarium, in its geometric centre. The aquarium was filled with water. When the water levels in the aquarium and in the bottle were equal, the gammarus individuals began to leave the bottle. In order to speed them up, the gammaruses were scared away using light. In order to define the distribution of gammaruses on the bottom of the aquarium and to count them (Photographs 6, 7), formaldehyde was introduced through the bottle, which killed the animals. An even spread of formalin is documented in Photographs 2 and 3, which were taken 1 min. apart. For photographic purposes, 10% sulphuric acid was applied in the ratio of 200 ml / 5 dm3 H20, and an indicator of water pH. III variant – with hideouts in the form of similar stones on the bottom of the aquarium (Photographs 2, 3, 8). Experimental series 1 to 4 were performed 1 day apart. In variants I and II no differences were observed between the number of animals in the aquarium parts over PIMAT and the parts underlaid by a sheet of paper. Variant III represented an adequate experimental system permitting the observation of the effects of PIMA *colour – tested with the SPECOL 11 photocolorimeter, the wavelength equalling 410 nm and cuvette 5 cc (correlated in mg Pt/dmT on the behaviour of gammarus. In the latter variant, series 1, in stone hideouts over PIMAT, 54 individuals of gammarus were identified while in the part without PIMAT only 16 animals were found. Corresponding values for series 2, 3 and 4 were 64 vs. 16, 54 vs. 40 and 92 vs. 90. Thus, the effect of PIMAT on gammarus behaviour was significant even if diminishing with each day (Table 10/XII). PIMA|T stimulates gammarus to gather in the region of PIMAT activity. 10. Effect of PIMAT on melanophores in fish in conditions of stress induced by presence of cyanophyceae, Oscillatoria sp. 10.1 Experiment with Lebistes reticulata. For the experiment, 10 fish were placed in each of two aquaria. Each fish weighed 1.5 g. Under one of the aquaria PIMAT was placed while a sheet of white paper was placed under the other aquarium. The fish were subjected to the toxic effects of cyanophyceae of Oscillatoria genus (Photographs 1 to 3). In Photographs 4 to 9 the shape and colour of melanophores is shown in the version with PIMAT and in that without PIMAT. No effect of PIMAT was observed on shape and colour of melanophores in the fish studied. 10.2 Experiment with Crucian carp, Carrassius auratus. For the experiment 10 fish were placed in each of two aquaria. Each fish weighed approximately 0.8 g. The experiment was conducted as above. The typical pattern of melanophores in stress-free conditions is shown in Photograph 10. In the Photographs 11 to 13, the aggregation of melanophores under the effect of cyanophyceae is shown in the absence of PIMAT, while the disappearance of melanophores due to their intense aggregation in the presence of PIMAT is illustrated in Photographs 14 to 16. No effect of PIMAT was observed in Lebistes reticulata fish on the shape and colour of the melanophores. In Crucian carp, the melanophores disappeared under the effect of PIMAT, as a reaction to the stress inflicted on the fish. The fish were placed in an aquarium positioned in homogenous outer conditions, including homogenous illumination. PIMAT was placed under one half of the aquarium, while a piece of white paper was placed under the other half. The fish were observed in an attempt to detect the effect of PIMAT on fish behaviour, expressed by the gathering of fish over PIMAT. Since photographs represented the best documentation of the experiment, 19 photographs taken at random intervals were enclosed with the report. The photographs illustrate the preference of fish for the part of the aquarium with PIMAT underneath. The accumulation of fish above the PIMAT was additionally documented by the more numerous fish faeces in this part of the aquarium. Analysis of preying intensity of Gammarus sp. The analysis of the preying rate of gammarus was performed in two aquaria, each 15 x 19 x 39.5 cm (Photograph 1). PIMAT was placed under one of the aquaria , while a sheet of white paper was substituted under the other. A suspension of a partially-decayed bioseston, obtained from Lake Rusalka, served as a medium. In the course of the experiments the aquaria were covered with white filter paper. Each of the aquaria was stocked with 25 individual gammarus. Each day the quantity of the suspension was estimated in Imhoff funnels, and the partially-decayed bioseston was supplemented with a new sample of the medium. The experiments on the intensity of preying of gammarus in the setups with and without PIMAT was repeated twice. Due to daily supplementation of the medium, the preying intensity should be compared separately for each day and within the same experiment: experiment 1 with PIMAT should be related to experiment 1 without PIMAT and the same system should be followed in experiment 2. In the first series of the experiment the quantity of bioseston was measured 6 times, in versions with and without PIMAT and each time a lowered bioseston content was detected in the version with PIMAT. The lower content of bioseston in the PIMAT version points to the more intense preying of gammarus in the presence of PIMAT. In the second experiment, the analogous result was obtained (Table 11/XII). PIMAT stimulates the preying of gammarus. The experiments on the survival of gammarus were performed in three culture variants, each including versions with and without PIMAT. Variant III – water supplemented with the herbicide, Fusilade, c = 0.0001%, with no nutrients. The experiment was conducted on Petri dishes, 13 cm in diameter, in the volume of 200 ml H2O. Each variant of the experiment was performed in 3 to 5 repeats. In the version with PIMAT gammarus deaths started earlier and on consecutive days gammarus mortality was much higher in the version with PIMAT, as compared to the version without PIMAT (Table 12/XII). In the version with PIMAT no deaths of gammarus were observed after 7 days although, at that time, deaths were noted in each of 4 repeats of the version without PIMAT. After 14 days, gammarus mortality in the version with PIMAT was, on average, 15% and in the version without PIMAT it was 20%. In the version with PIMAT markedly higher mortality was noted, measured twice, at one-hour intervals after adding the herbicide. After one hour the mortality was, on average, 86% in the version with PIMAT and 32% in the version without PIMAT. After two hours, the corresponding values were 98% and 78%. In the absence of nutrients gammarus mortality was higher, which resulted from the acceleration of metabolic processes by PIMAT. In the presence of nutrients gammarus mortality under the effect of PIMAT was decreased. In the presence of herbicide and under the effect of PIMAT gammarus mortality increased due to the acceleration of metabolic processes by PIMAT. The experiment aimed at determining the effects of PIMAT on the survival of crayfish eggs in conditions of temporary toxicity in the form of oxygen shortage. The experiment included egg-development time from the stage of embryo with developed heart to thte stage of embryo with developed eyes. The experiment was performed in aquaria. In the version with PIMAT and in the version without PIMAT the number of eggs was the same in each of four repeats and ranged from 90 eggs in repeat I to 165 eggs in repeat IV. For each repeat, the number of viable eggs was determined as related to all eggs in the repeat. The experiment lasted 14 days at a temperature of 14 to 16O C. In the course of the experiment on three occasions oxygen shortage was developed, reaching 30% saturation of water with oxygen. The decreased oxygen content caused a drastic decrease in egg viability. Marked differences were observed in egg survival between the versions with or without PIMAT. In the PIMAT version the survival was, on average, 11.9% while in the version without PIMAT it was 1.1% (Table 13/XII). PIMAT decreases the mortality of crayfish eggs in toxic conditions, viz. a drastic decrease in the oxygen content of the cultures. The aim of the experiment was to define the effect of PIMAT on the development of crayfish from the stage of embryo with developed heart to the stage of small crayfish after the first moult. Throughout the experiment the crayfish eggs remained under the care of female crayfish. The experiment was performed on two crayfish, each of which carried 150 eggs. For the period of the experiment, the two females were placed in two separate aquaria. PIMAT was placed under one of the aquaria and the other served as a control. Immediately before the first moult, 20 small crayfish were caught in nets from each of the aquaria, decreasing the number of potentially obtainable crayfish to 130 in each aquarium. After the appearance of the young crayfish, four readouts were made to discover how many had passed the first moult: stage 0 – appearance of the first young crayfish; the later stages at 24h, 48h and 96h. After each readout young crayfish were caught in nets. In the variant with PIMAT, the number of crayfish after the first moult was higher at each readout than in the variant without PIMAT (Table 14/XII). After 96h of the experiment almost all the crayfish in the PIMAT variant had already passed the first moult (129 young crayfish per 130 eggs) while in the variant without PIMAT only less than half of the crayfish (64 young crayfish per 130 eggs) had passed the first moult. PIMAT stimulates the development of crayfish from the stage of embryo with developed heart to small crayfish after the first moult. Effect of PIMAT on development of amphibia from stage of egg to stage of larva – tadpole. The experiment was performed on amphibian eggs collected in nets from a single water tank. The eggs were mixed to take into account the possible effects of different temperatures during their development in the tank. After mixing, the eggs were placed in an aquarium divided by a partition into two equal parts. The partition prevented translocation of eggs but permitted water exchange between thte two parts (Photograph 2). PIMAT was plliaced under one half of the aquarium. An equal number of eggs was placed in each half of the aquarium. Each day at the same time the number of eggs, wphich had transformed into the larval stage – tadpoles – was counted. The monitoring aimed at detTable No. 9/XII. Photos 1ermining the time needelid for egg transformation in the presence of PIMAT and in its absence. Temperature was the principal factor directly affecting larval development. Before setting up the experiment described above it was found that the environmental temperature must rise to 16O +/- 1O C (for eggs of this and only of this tank) in order to detect differences in amphibian development, reflecting the PIMAT action. Cultures were maintained in three such aquaria in parallel. The data shows that the rate of larvae appearaance is 2- to 3-fold faster above PIMAT than in the control conditions. In the photographs, a larger accumulation of larvae can be observed and a bigger quantity of faeces in the version with PIMAT than in the control version. PIMAT stimulates the rate of appearance of larva in the frog. Effect of PIMAT on mitotic activity of leukocytes in sus scrofa L.
From 12 pigs appropriated for slaughter blood was taken into sterile tubes and transported to a lab. Twenty-four leukocyte cultures were set up, according to the Moorhead technique. The cultures were incubated at 37 CO for 3 days. The culture vessels each contained: 7 ml RPMI-1640 medium, 0.1 ml glutamine, 1 ml calf serum, 0.1 ml PHA-M /Sigma/, 0.01 ml antibacterial agent and 2.5 ml leukocyte containing plasma, isolated from 10 ml heparinized blood. Two hours before harvesting the cultures colchicine was added to each culture. 0.075 M KCL served as a hypotonic agent. The cells were fixed with a mixture of methanol and glacial acetic acid (3:1). The preparations were Giemsa stained. Leukocytes from 4 pigs were cultured in altered standard conditions in an attempt to find out if PIMAT can substitute for the routine mitogen, i.e. phytohemagglutinin. Other conditions of culture corresponded to those described above. In one case the culture was set up in duplicate, for the remaining 3 cases single cultures were established for a given version. All the cultures were run in a standard way in two groups: in one version the cultures were subjected to PIMAT action during the incubation while in the other version the cultures remained outside of the PIMAT action range. The two versions of the cultures always originated from the same donor. Mitotic indices were calculated after counting 1000 cells in each culture. The significance of the differences was examined using Student’s test. Part I of the experiment. In cultures which were free from PHA-M but which were subjected to PIMAT action no dividing cells were observed and the cell material was scanty. This indicated that PIMAT cannot play the role of a stimulating agent, capable of inducing leukocyte divisions. Part II of the experiment. f) Due to the low level at which the PIMAT advantage has been observed the experiment should be repeated on a much broader experimental scale. 18. Rate of individual development in fly, Callaiphora vomitoria from larva to imago stage. The aim of the experiment was to compare the rate of individual development of the fly, Calliphora vomitoria, from larva to imago stage in the presence of PIMAT or in its absence. The experiment was performed with two repeats: in flasks of 200 ml capacity (repeat I) and in Petri dishes, 13 cm in diameter (repeat II), each with versions with and without PIMAT. In the experiment with the use of flasks, 13 flasks were used, each housing 3 flies in the version with PIMAT and the same number of flasks and flies in the version without PIMAT. In the experiment performed on Petri dishes, 4 dishes were used, in each version. Each dish housed 50 flies. The experiments were conducted at 22O C with no access of light. In the presence of PIMAT, a higher rate of fly development was documented, beginning from the larval stage to the imago stage. In the experiments conducted in flasks, in the version with PIMAT one day after the eggs were laid on the medium all the larvae in the 13 flasks had transformed into pupae. In the version without PIMAT the same happened with all except two larvae. A significant difference was observed on day 8 when all pupae in the PIMAT version had transformed to the stage of imago while in 13 flasks without PIMAT 7 still contained pupae. In the version without PIMAT pupae were still noted after 13 days of the experiment when no pupae remained in the version with PIMAT. A similar result was obtained in the experiment conducted on Petri dishes. The data of experiments 1 and 2 are shown in Table 18/XII. PIMAT stimulates the developmental cycle of the fly Calliphora vomitoria beginning at the larval stage to the stage of imago. XII. 19. EFFECT OF PIMAT ON NUMBER OF LYMPHOCYTE DIVISIONS IN DOMESTIC PIGS. The number of lymphocyte divisions is a good indication of cellular activity. Lymphocytes from a domestic pig were subjected to a series of tests. The reason for choosing this material for testing was the easy availability of the lymphocyte culture. The blood was obtained from a local slaughterhouse. It was placed in test-tubes with heparin (100 units per ml. of blood) and transported to the Department of Genetics in vacuum flasks filled with ice cubes. The blood was given a centrifugal spin for 7 minutes at a speed of 1,000 rpm. Then 2.5 ml of supernatan was taken out and put in a culture flask. The culture flask was sealed and placed on a thermostat kept at 37O C. The total culture time was 72 hours. Every few hours, the culture flask was shaken. After 67 h some colchicine was added to make the metaphase plates visible. After spinning the cell culture (7 minutes at 1,000 rpm) 0.5% KCI liquid was added. This made for better visibility of the disintegration of the nuclear membrane and the metaphase plates. Then the cells were fixed with Carnoy’s reagent and stained with fixine. When the cells had changed colour they were examined under a microscope and the number of cells was calculated in units of 1,000 (mitotic index). The above procedure was used in all five cycles of the tests. In each cycle the influence of PIMAT on the lymphocyte division of one donor was examined: 3 flasks were put on PIMAT and 3 were not (controls). In the tests carried out, under the influence of PIMAT an increased number of cell divisions was observed compared with those in the control tests. The number of lymphocytes with PIMAT (5%) was 20% higher than the controls (4.3%). The increase in the number of cell divisions is linked with a decrease in the cell cycles, the intensity of the DNA replication process and the synthesis of albumen, all directly linked with the cell division. Moreover, the analysis of the statistical standard deviation shows that there is a higher stability of the cell divisions in tests carried out under the influence of PIMAT than those without it. All the material for this publication was provided by PIMAT of Poland. The work of editing and re-translating has been carried out by Zena Maddison of London, with some assistance from Roman Czekaj of AZA/IMPEX , Basle, and Christiane Knight of Sussex. The project was to establish the effect of PIMAT on the response to pain, on sleep and the mental condition of patients hospitalized at the surgical ward under discussion. Their condition was determined on the basis of daily observations made by a physician and the patients themselves. The subjects in the experiment were fifty patients at the surgical ward. Data were collected daily and recorded on charts. In the morning, at the temperature taking time, the patients determined their condition by answering the questions: How did the day go? How was the night? Simultaneously, the physician analyzed the amount of analgesics, hypnotics or sedatives administered to a patient over the 24 hour period. Group I – patients with compound fracture of the thigh and shank bones, treated for a long time in skeletal traction. This group included 20 patients, 15 of whom were over 75 years old. Group II – 15 patients who suffered from various gallbladder, biliary tract and pancreas related conditions. They all were in bad condition and complained of acute pains. Six of them had itching of the skin caused by jaundice. Group III – 15 patients suffering from diseases causing severe pains: stomach cancer duct, colorectal or mammary carcinoma at various stages of advancement. Some of the patients were in very serious condition – metastases had invaded bones, lungs and brain. In this group of patients were also five persons suffering from spastic colons and recurring colon abscesses. All the observations, remarks and interviews were recorded on specialist examination charts (the originals of the charts are filed together with the remaining set of original research documentation on PIMAT, and are available to everyone interested). Having completed a series of examinations of the aforementioned 50 subjects, the results obtained from the three experimental groups were analyzed and compared. Group I – a certain regularity was noticed: with PIMATs applied, pain in the fractured limbs considerably decreased, sleep was better, and the patients calmer, some of them even feeling well, after two or three days at the latest. The patients asked neither for sleeping pills nor for pain killers. Group II – in spite of the pain suffered by the patients under the present investigation, which condition required administration of analgesics, the patients became calmer and slept better as soon as five days after PIMATs were applied. It should be noted that the itching of the skin in the jaundiced patients began to subside. Group III (most seriously sick) – the patients were eventually administered little or no analgesics as they simply did not demand them. Moreover, their sleep was more regular, their general well being improved and so did their faith in the improvement of their condition. It is also worth noting that a certain regularity was observed in the improvement in the condition of the patients suffering from spastic colon and mild forms of colon abscesses — their stools were regular and they stopped complaining of flatulence and pain. The results obtained from the examination of a large group of patients exposed to the PIMAT regenerator of vital forces have led the experimenters to the following conclusion: PIMAT is not a replacement for pharmacologic treatment, but it is an auxiliary element which significantly reduces the quantity of analgesic, hypnotic and sedative medications administered to patients. 1. The subject of research. The product is a prefabricated rectangle made of linen cloth with dimensions of 18×18 cm. On the upper side of the product there are 10 red circles and a PIMAT sign. 1.1. The goal of research. According to recommendations of the manufacturer of the subject of research, the goal is to evaluate effectiveness of the product PIMAT in it’s clinical use for people with pains of peripheral nervous system and nervous upsets. 1.2. Materials and research method. The research has been conducted in 103 persons (80 men, 23 women) aged 28-56. 42 of the subjects with waist-sacral pain syndrome in the exacerbation phase, 61 people with neurasthenia with a sleep disorder. PIMAT according to the manual has been placed under the sheet of the examined people in the area of loins for 7 days. The neurological state of all the examined people has been evaluated during and at the end of the research, EEG has been registered, a self-evaluation of general affection according to questionnaires (SAN, active phobias). The statistical relevance of the results has been evaluated by the T-Student test. There have been no cases of bad reactions to PIMAT’s actions during the clinical research. Some people have noticed “the feeling of warmth”, “a pleasant compression”, in the place of implementation. For people with the symptoms of the waist-sacral syndrome usually on the 4th, 5th day of using a decrease in pain’s intensity in the waist area has been noticed. Objectively a decrease in plasticity in the area of waist has been observed, practically no symptoms have been present. In the group of the examined with neurasthenia on the 2nd ,3rd day sleep has normalized and has been adequate to it’s depth and lasting time, on waking up there has been a felling of complete rest. Characterizing the general affection of the examined according to questionnaire methods it has to be emphasized that at the beginning the general affection in the whole group could be characterized as: pretty low level of general affection, activity and mood at high results of reactive phobia. (see the table). The indicators of questionnaire methods logically reflect the expressed neurotization of examined people. After the therapy with PIMAT statistically relevant (to p < 0,05) increase in the indicators of general affection and mood according to the SAN method has been observed. Relevant changes in the activity indicator have not been noticed. The level of reactive phobia after implementation of PIMAT has been statistically lower than in the beginning. * – statistically relevant parameter change. During the analysis of an EEG recording after comparing it with the beginning state, the occurrence of fast-wave component of beta-diapason waves has decreased. Using PIMAT hasn’t caused any pathological changes in the spectral recording of EEG. The results achieved with clinical tests allow to think, that PIMAT show therapeutic effects with the waist-sacral syndrome, decreases the pain syndrome, normalizes sleeping with neurotic disorders. Using PIMAT causes no harmful effects. PIMAT has changed my life after 2 months of using it. My problem was connected with arterial hypotension, which complicated my personal and professional life. Everything has changed since I began using PIMAT. I wake up in the morning alone after 7,5 – 8 hours of sleep, rested and with great general affection. I control my arterial tension, which is on average 130/80, and before it has never exceeded 115/65. My friend, who slept very alertly and often suffered from insomnia, since the day she has used PIMAT she sleeps perfectly and as a great general affection. So small, but so effective. I have been sleeping on it for 3 weeks now, but I already feel a great relief. I suffer from rheumatoid arthritis, and I couldn’t sleep because of the pain. Now I sleep well, I can slightly bow my knees with no pain. Also my husband, who suffers from spine degeneration, has felt serious relief. I would like to thank you very much for PIMAT – its effects on my health are outstanding. I feel like I regained my old inner energy, I don’t know what headache is anymore and I very easily deal with any viral infections. Before, I had been suffering from lumbago for 5 months, and then from sciatica; after 2 weeks from receiving PIMAT, the pain became milder and started to gradually disappear. After 3 months, the pain was gone. It is a wonderful discovery, works like bio-currents. My neighbor gave me PIMAT, within three days my spinal cord’s pain has completely vanished. I would like to thank for such a the wonderful invention as PIMAT. By complaints such as: bone pains, headaches and general tiredness ceased in the morning after getting up from my bed. A seven year old child wet himself in the night, currently the complaints have stopped. He sleeps well. The result is incredible – I have had sick legs for over three years, constant pain in my feet, knees, sleep disorders, spiking tension. Everything has ceased – above all the feet, knees, the pain has dissipated, sleep like of a young girl’s. I get up stronger, more rested, my tension has also sort of dropped. God bless. I would like to thank you for this effective invention, that I use for my Burger’s disease. After about 4 months of using PIMAT inflammations of blood vessels have ceased. I would like to thank you for such a great invention as PIMAT. My mother has had diabetes for 20 years and has completely lost sight. For a year, she has been suffering from arteritis and phlebitis, and the Burger’s disease became so serious that nothing seemed to help. I put PIMAT to my mother’s bed not telling her about that, because she does not believe in such treatment. And since I change her bandages, I could observe the results. After 6 weeks of using PIMAT, a left-foot toe, which used to be black as coal and the wound was 4-cm long and 2-cm wide healed perfectly and both arteritis and phlebitis abated. I also felt the effects – for 8 years I’ve had problems with my spine and legs; initially, the pain was stronger than before, but after 3 days it disappeared. I have been sleeping according to tips on “PIMAT” for a month. My complaints connected with very low blood pressure and headaches have ceased. I feel much better. Medicines that I have used so far have produced almost no effects. PIMAT has a positive influence on my mental state and my complexion. I feel like I had more vital spirit and energy. I have gone through four surgeries, chemotherapy and irradiation, and at the moment I can go for very long walks. My daughter is also amazed with the effects of PIMAT – for 3 months her periods have been completely painless. I was always very weak (dizziness during changing weather and strong winds, high pressure, frequent headaches, neurosis, diseases of circulatory system). After using PIMAT for 2 weeks, I felt more energy in my body. In the beginning, the pains became stronger, but I stopped feeling dizzy. Now, I haven’t had a headache for a few days and I am very happy. I am an 80-year-old, sickly woman. I felt pain in my hip, and it stopped after two nights. My knees ached, and they don’t ache now. I had problems with sleeping, and they are gone now. My finger was rotten for a year, and it healed in a week. A wonderful invention. I turned out to be revolutionary. My child is rested, it gets tired less and is more resistant to sicknesses. I am a retired miner and I had many complaints – spinal pains, radicles’ inflammations and many more. Since I have begun using PIMAT (2 years) I am incredibly healthy. After using it for 3 weeks the pains have ceased (they were very raging). It is a really incredible way of repairing the health. After a few nights I feel like a newborn. Tiredness ceases, rheumatic pains are no longer, headaches dissipate, a man replenishes life force. It has also helped my husband, and also my close ones and child. Our general affection has improved and headaches, feet pains and especially back pains have ceased. I have been using PIMAT for 3 months. My blood pressure was high (170/110) but it has been regulated and now it is within the norm. It has given me enough health, that I could walk to church without a stick. It has cleared my lungs, regulated my pressure, partly has caused the rheumatic pains in my knees to cease, the pains in my arms and hands have dissipated. I have SM, I had trouble sleeping due to frequent reaction of my lower limbs. Now the frictions, their frequency have considerably decreased, back pains have also become less intensive. My headaches are gone. After 3 weeks, I felt much better. The pains in my spine got milder, my low pressure (95/50) was regulated to (125/80), I am not sleepy all the time, I just know I want to live. I have been using it for a month and I feel very good. I used to feel pain in my liver and gall bladder, and they are almost entirely gone; I also stopped feeling rheumatic aches and I sleep well. My 7-year-old child used to wet its bed and now everything is fine. Thank you for this invention and I hope it helps thousands of people. For the first time in many years I had a painless period, and my other complaints are no more. We ordered PIMAT a month ago for our 14-year-old daughter constantly suffering from chronic viral infections, and – in consequence – from bronchial asthma and allergy. PIMAT had very positive effect on minimising these conditions. General weakness, nervous tiredness and insomnia are also over. What returned is complete balance, calmness and healthy sleep. I have been using the regenerator for a month. My health has significantly improved. I am 55 years old. Since I was 20, i.e. for 35 years, I have been suffering from spine disease and pain. After three weeks of sleeping on PIMAT, I hardly ever take any medicine. I sleep very deeply. I am stronger than ever. Now I really want to live. My daughter has been bitten in her leg by a wasp, which caused allergy. Drinking lime hasn’t helped, constantly new blotches have been created, quite itching. I laid my daughter on PIMAT. After one night the blotches have disappeared, and the itching has gone. Using PIMAT turns out to be helpful. After 2 weeks a significant improvement (rheumatic, circulation and other issues). I am very glad as it has eased my pain. It has cured my sick blister and now I can go to bed sleeping not urinating every few minutes. I do not see my sick legs anymore. My husband has been cured from chronic wog, and me, although I have been sick all my life, feel much better now. who specializes in natural treatment methods. A patient was suspected to have neurological changes, showed symptoms of depression and chorea, suffered from a total sleep disorder , had a pricking sensation in the entire body, as well as problems with thinking and coordination. The patient – a woman aged 40 – slept normally the very first night PIMAT was applied. The symptoms she suffered from were reduced to disappear after a few days. Female – aged 80. Arthritis. She suffered from pains and could not leave the bed. Resigned, the patient did not believe that anything could help her. Her daughter placed a PIMAT under her bedsheet without her knowledge. The following morning the woman got up by herself and did some walking during the day. Female – aged 35. Ischias with radiating pains. After one night’s exposition to PIMAT her pains subsided. Although they returned during the day, they were completely gone after several days . Female – aged 63. Arthritis. Degenerative changes and pains. Although treated with acupuncture and homeopatic medicines, which help a great deal, she feels there has been a dramatic change for the better since she started using PIMAT. Female – aged 70. Coronary disease, circulatory insufficiency, arteriosclerosis (noticeable loss of energy, circulation and strength), difficulties with walking, middle ear infection, pains in the back and legs, blood pressure changes, impaired efficiency of the left kidney. Only after one night of being exposed to PIMAT, she felt better during the day, became more energetic, and her face changed its colour from paper-white to pinkish; she was also able to make a better use of her arms and legs. After a few days further improvement was noticeable – the ear infection disappeared and the hearing got better. Boy – aged 7. Hyperexcitability, sleeping disorder, bed wetting. With PIMAT, the boy sleeps soundly. Nightly bed wetting is now infreguent. Female – aged 55. Cholelithiasis, right-side pains, headaches, sleeping problems. With PIMAT she sleeps soundly and no pains occur. Female – aged 50. She suffered from headaches for 20 years. At the moment she started using PIMAT headaches stopped. Male – aged 50. Breast carcinoma with metastasis. Bone pains in the entire leg. With PIMAT the pains subside and he feels better. Male – addicted cigarette smoker (up to two packs a day) with very poor circulation in the legs, which made walking impossible (terrible pains). After a dozen days of using PIMAT the pains lessened. The man is now stronger and has regained his motivation to live. Female – aged 48. Inflammation related pains in the ovaries, menopause problems – considerable pressure and heat rushes in the head – headaches, sleeping difficulties. The patient was treated with homeopatic medicines, which helped, but her problems disappeared almost entirely shortly after she started using PIMAT. The present observation was made on children and teenagers treated in an outpatient clinic for chronic respiratory track conditions. Over a period of three months the patients under examination suffered from hayfever, asthma, allergic respiratory tract inflammation and obturating bronchitis. All the patients reacted favourably to PIMAT used in their treatment as a regenerating and supporting element. None of them claimed to have a negative reaction from their organisms. Among the favourable effects reported by the patients were their overall better frame of mind, better and more restful sleep, better appetite and reduced symptoms of their conditions. Out of the 100 patients under the present observation, 34 claimed to have no improvement in their condition in the first month. In the third month, however, only 20 patients said there was no change for the better. As early as the first month of the experiment, 53 patients noticed improvement, of which 44 continued to feel better throughout the observation period. in the third month by 47 patients. Considering the chronic character of the patients’ conditions -difficult and slow to treat by standard procedures – it may be stated that PIMAT favourably supports treatment of patients. Over 2 million people worldwide have bought the Pimat.